In the Edit palette, you can undo and redo recent changes. You can also see how many undos are available. If you’re editing (sculpting) a 3D object or working with Spotlight images, you’ll find an additional pair of Undo and Redo buttons just for those actions. Undo the last Canvas action. Undos for the Canvas undo any 2.5D painting in the canvas. They do not effect your 3D Tools. Press the Undo button to undo the most recent painting action. The Undo button also shows you how many undos are available; this number depends on the amount of memory available to ZBrush. Press the Redo button to repeat an undone action. This button is only active if Undo has been pressed, and no other actions have been performed. The Redo button also shows you how many Redos are available. The Undo Spotlight will undo any distortion that has been done to a texture when it has been altered by Spotlight. This only becomes active when a texture has been added to Spotlight. The Redo Spotlight will redo any distortion that has been done to a texture when it has been altered by Spotlight. This only becomes active when a texture has been added to Spotlight. Every sculpted object contains its own set of undos and redos until you quit ZBrush. Press the Tool Undo button to undo the most recent editing action. This button is only available when a 3D object is in a Transform or Edit mode, and only undoes editing (sculpting) actions on this object. Every sculpted 3D object retains its own set of Undos and Redos until you quit ZBrush. The Tool Undo button also shows you how many undos are available; this number depends on the amount of memory available to ZBrush. Press the Tool Redo button to repeat an undone editing action. This button is only active if Tool Undo has been pressed, and no other editing actions have been performed. The Redo button also shows you how many redos are available. 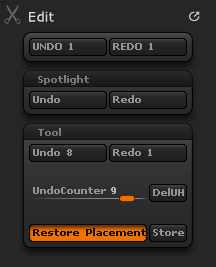 The Undo Counter slider allows you to navigate through the current subtool undo history, as an alternative to the Undo or Redo buttons. The Delete Undo History button will delete the whole undo history for the current subtool. The Restore Placement switch moves your camera to match where it was at the stored history point. This is useful for history movie playback. When the Store button is pressed ZBrush will replace the camera position stored in the current history point with the current camera position. This operation is useful when creating a movie using the history information and when a camera position must be replaced or modified.